Parents, are you looking for a way to engage your children to tell the story of the Birth of Jesus? Well, here is a wonderful tool (and it’s FREE) that you can use with your children – Little Bird Tales. Very easy to use! 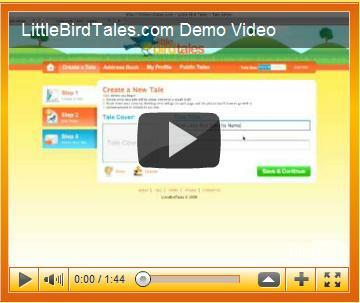 When you are on the LIttle Birds website, click on the LittleBirdTales.Com Demo Video (that looks like the following image) for a quick overview of how to use this website. your child can create their Christmas story and share with members of their family. All you need – imagination, drawing tools and paper, microphone, and a digital camera (a cellphone camera works)! Check out the public stories that you find in the PUBLIC TALES tab. One that caught my interest is an Easter Story. Here is a wonderful example of a child telling their story. Sorry – it’s Easter, not Christmas! Here’s an opportunity where you can visit the crèche at your church after Mass and have your child use the camera to capture images of Mary, Joseph and the baby Jesus. Once they have their photo’s they can come back home and use them to tell the story about the Birth of Jesus which they heard in their class, or you read the story to them, or – who knows where they heard the story. Here’s the chance for them to pass on this wonderful story to others! Now is the time to encourage them to tell the story in their own words and with their own creativity! What better way to have them engaged in one of the great stories of our Christian tradition. DRE’s and others who are involved in your parish catechetical/religious education programs. You may wish to send this link to your parents, or add the link to your parish website, or use this link in any way to encourage your parents to involve their children in telling the Christmas story. When the children have completed this Digital Storytelling, they can email the link to others in their families! What about to grandparents, aunts and uncles, cousins who live in other cities? Hope you enjoy and have fun with this activity! Would love for folks to come back to this post to share the links of the stories that have been created. Remember, if you like this post, click on the “Like” button! I was unable to play the demonstration video for little bird tales – sound neat though! Hi Susan, Remember to go to the Little Bird website where you should be able to click on the video icon. The video should play here. If not, you may have another issue at your computer that is not allowing you to play the video. Not sure what it might be!